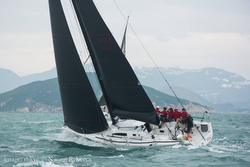 (Hong Kong, China)- The 26th Edition of the China Coast Regatta saw thirty-five yachts compete across seven divisions. The racing took place in the waters to the east and south of Hong Kong Island, with some islands courses extending into the waters to the east of Sai Kung. The regatta host was, as usual, the extraordinary Royal Hong Kong Yacht Club. There were perfect conditions across the race track with blue skies and a 10 to 15kts northeasterly breeze. 28 boats took to the race track, which was located southeast of Hong Kong’s Lamma Island. All IRC racing divisions sailed one windward / leeward and an islands course. The first race of the day saw many competitors get a feel for the conditions, with sailors tightening up their drops by the end of the race. For Race 2, sailors were sent on 19 to 32nm course depending on their division. Given the wind direction, sending yachts from Yuen Kok in the direction of the Ninepin Islands made for a giant windward/ leeward with a few obstacles in the way– just islands! The breeze picked up for the second day. A 20-25kts northeasterly breeze greeted the sailors as they reached the race track, which was located to the southeast of Lamma Island. The IRC Racer classes sailed three windward/ leewards and had four retirements in the first race of the day, which looked to mostly be spinnaker-related issues. IRC Premier Cruiser sailed two islands courses and HKPN were given one windward/ leeward and an island course. As the day progressed, the breeze moderated to around 15kts and the sunshine came out making for the best sailing conditions Hong Kong has to offer. 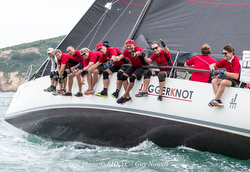 In IRC 2 Class, Richard Van Den Berg’s J/111 JUGGERKNOT was tied for first place. Another superb day of excellent conditions; 15kts, sunshine and blue skies. Racing got away smoothly with all IRC Racer and HKPN divisions sailing one windward/ leeward and one islands course ranging in distance from 10 to 16.5nm. The islands course took the fleet on a beat towards a windward mark and reaching to an ocean mark before rounding Beaufort or Sung Kong and finishing off Bluff Head near Stanley. In the end, the J/111 JUGGERKNOT skippered by Richard Van Den Berg took second place in IRC 2 Class. Meanwhile, over in IRC 3 Class, the J/109 WHISKEY JACK sailed by Nick Southward also took the silver in IRC 3 Class with his crew of Peter Albert Baer, Nigel James Clark, Joakim Josef Gip, Sam Johnathon Phillips, Nicholas Johan Southward, and Alec Peter Tracy. Congratulations to all! 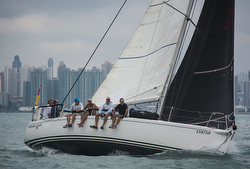 For more China Coast Race Week sailing information Add to Flipboard Magazine.